A Variety of Wood Cuts - Jacaranda, Inc.
Jacaranda offers four main cuts for our wood veneers: flat cut, quarter cut, rift cut, and rotary cut. Flat cut produces the most symmetrical cathedral pattern. 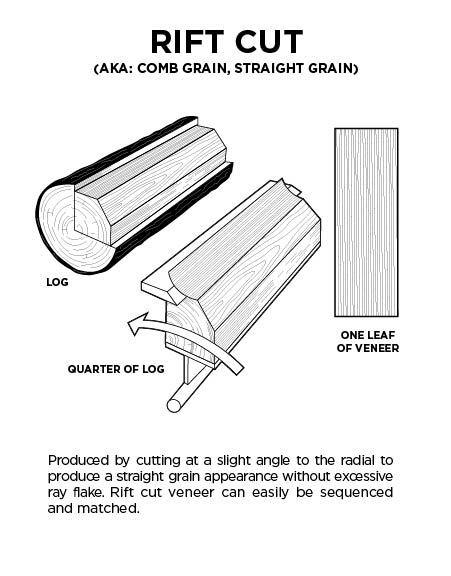 Quarter cut generates a much straighter wide grain and less dramatic than Flat Cut, but more pronounced than Rift Cut. Rift Cut produces a straight-line pattern across the face and has a unique linear appearance. And finally, Rotary Cut has extremely wide and broad pattern of growth rings, which makes the matching of leaves next to each other very difficult. Flat cut produces the most symmetrical cathedral pattern. 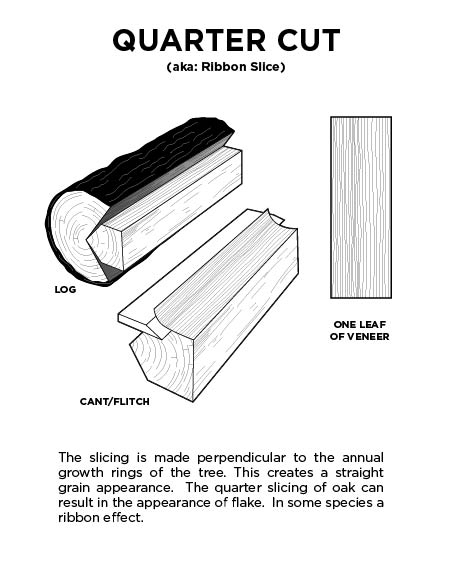 The cut is widely specified architecturally to create a match appearance and a look into the growth rings of the tree. Typically the veneer leaves are book matched and sequences giving an overall appearance of uniformity, but much more dramatic and pronounced grain effect than Rift or Quartered. 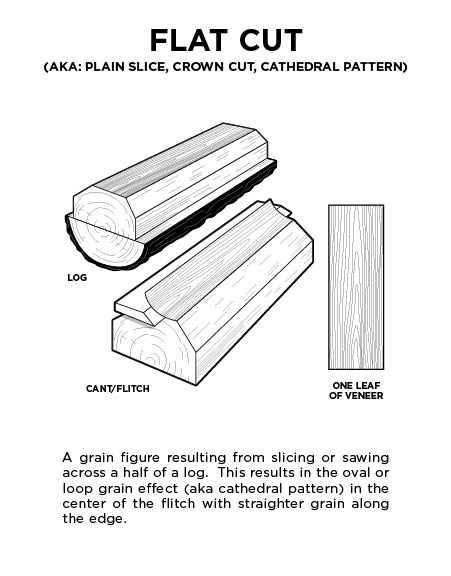 Quarter cut generates a much straighter wide grain and less dramatic than Flat Cut, but more pronounced than Rift Cut. 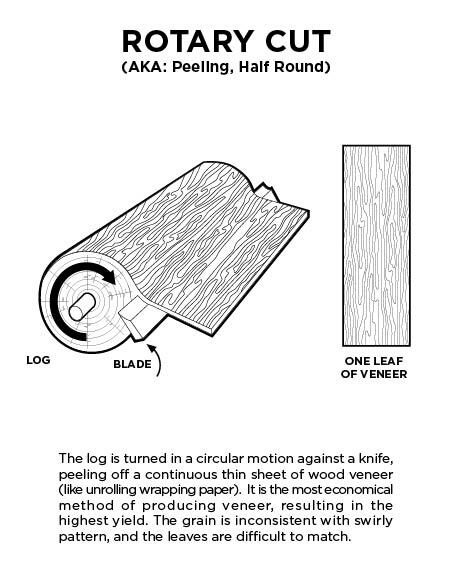 This cut is often utilized to show off unique features of the wood such as Flake in Oak or Fiddleback Figure in Anigre. The grain is typically not as close knit as Rift, but totally different than Flat Cut. Rift Cut produces a straight-line pattern across the face and has a unique linear appearance. Rift slicing is mostly done with Oak, both White and Red. However, rarely done with other species. In some cases, a very comb grain appearance can be present. 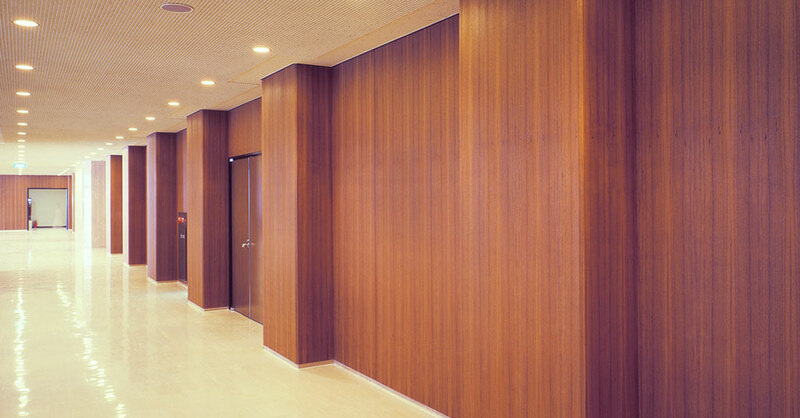 A highly specified cut which almost makes the wood disappear, yet creates a mood and feeling of natural wood materials. Rotary Cut has extremely wide and broad pattern of growth rings, which makes the matching of leaves next to each other very difficult. The produces a swirly grain appearance and is not typically noted as an Architectural cut. However, many prized species of burls are cut in this fashion to showcase its’ unique character and beauty.